: The shepherd dog from the Karst Massif is a shepherd dog by excellence and a good guard; today he is more often used as a guard and defence dog; in recent times he is mostly a family dog, but remains nevertheless essentially a perfect shepherd dog. : Mrs. Peggy Davis. Revised by Mrs. Sporre-Willes and Mr. Triquet. : The Karst Shepherd Dog is a breed which has existed for several centuries and which belongs in the molossian group. Probably this dog followed the Illyrians in their migration through Istria and the Dalmatian islands and settled in the Slovenian region of the Karst Massif. The breed was mentioned in writing for the first time in 1689 in the book of Baron Janez Vajkart Valvasor « The glory of the duchy of Carniole ». The breed and its standard were officially recognized on the 2nd June 1939 under the name of « Illyrian Shepherd » during the general assembly of the F.C.I. in Stockholm. At the general assembly of the F.C.I. 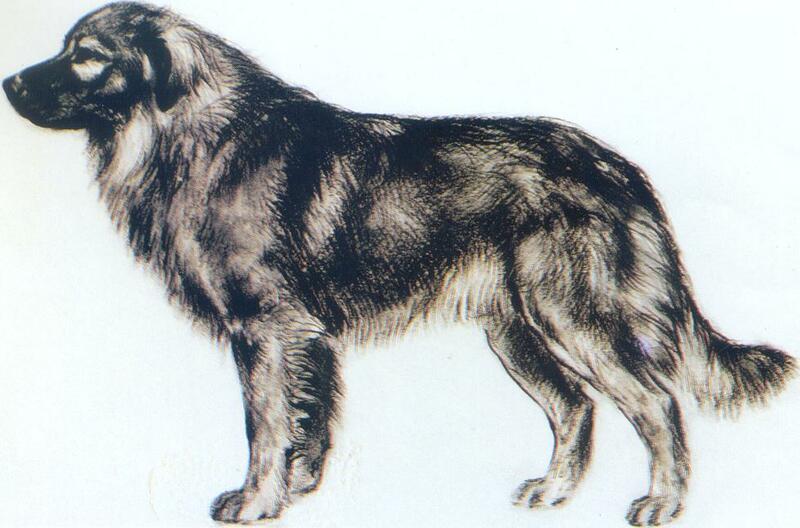 in 1948 in Bled-Slovenia, the standard was completed and the breed recognized again. Up to 16th March 1968 however, the Shepherd of Illyria of the Karst Massif carried the same name as the shepherd from the Sarplanina Massif. In the presence of two shepherd dogs carrying the same name, the Central Society of Yugoslavia decided to name the one from the Karst region « Shepherd from the Karst Massif » and the other one « Sarplaninac ». Since that day, those two breeds have been totally independent. : The Karst Shepherd Dog is of medium size, harmonious, robust, endowed with a well developed musculature and a strong constitution. The tail and ears are hanging. The coat is iron grey, long and abundant. : Of good, moderately sharp temperament, courageous and valliant but not biting, very devoted to his master. Incorruptibly good guard, distrustful of strangers; pleasant companion dog and obedient, whilst maintaining a strong individuality. : Of pleasing appearance while being proportionately large in relation to the body; it must be neither fine nor coarse. The upper profile of the skull and muzzle are slightly convergent. Seen from above, it is wide at ear level and tapers imperceptibly towards the nose. Seen in profile, it is deep and rounded. The length of the head, from the occipital protuberance to the tip of the nose, is of 24 to 26 cm. The skull is a little longer than the muzzle. : Quite developed, lean with fine muscles; its profile being slightly convex, seen from all sides it is rounded. Width of the skull at ear level is equal to the length of the skull. Superciliary arches moderately accentuated; frontal furrow moderate; median crest slightly convex without accentuation of the occiput. : Only slightly pronounced, not abrupt. : Black. Broad, well developed, slightly exceeding the front line of the muzzle. : Of medium length, broad and deep at its base, reducing progressively towards the nose. Muzzle straight and broad. : Thick, tight, well fitted, without forming pockets; black pigmentation. : Complete dentition, strong teeth, especially the incisors; scissor bite. : Laterally a little prominent, strong but not too developed, modelling a rather shallow face. : Relatively wide apart, neither prominent nor sunken in the sockets, almond shaped, of chestnut colour or dark brown; frank expression, calm and firm, almost melancholic because of the black pigmented eyelids. : Moderately high set, of medium length. The tips can reach the outer angle of the eye. They fall flat, in the shape of a « V » against the cheeks, the inner borders being folded outwards. : Broad, thick, well muscled; oval cross-section; upper profile straight or slightly curved, lower profile straight. Of medium length (about 25 cm), is deeply set into the shoulders and attached to the head and body by strong muscles. Skin thick, tight-fitting, without dewlap. Thick coat with long hair, forming a ruff and a well furnished mane, which makes the neck appear shorter and stronger than it is. Proud carriage, slightly raised. : Well developed, of medium length, thoracic part long. : Straight, horizontal or slightly oblique. : Long, of medium height, of good width and well linked to the neck. : Straight of medium length, muscled and broad. : Lumbar region rather short, very muscular and broad. : Of medium length, broad, very muscular; towards the root of the tail slightly inclined. : Well developed and well let down, voluminous in width and of good length; ribs broad, flat, moderately sprung; forechest well developed with sternum point quite rounded; length of 25 to 28 cm, its circumference is of 70 to 78 cm. : Belly slightly raised and tucked up, tight; flanks short moderately cut up. : Solidly attached to the body, wide at the base; in normal position, sabre shaped, at tip often with a slight hook; of medium length, must at least reach the hock; bushy with long hair, without forming a plume; when the dog is alert or moving the tail is raised up to the level of the back or slightly above it; at rest, it is carried low. : Straight, seen from the front or in profile; the different parts of the limbs (quarters) are very harmoniously linked together. : Shoulder blades of medium length, wide, oblique, well muscled and firmly attached to the body. Scapular-humeral angle close to a right angle. : Relatively long, more slanting than the shoulder blade, of strong musculature, close to body. : Humeral-radial angle not too open; the elbow, close to the body, must be at sternum level. : Sufficiently long, straight; strong bone structure and musculature. : Strong, well jointed to the forearm as well as to the metacarpus. : Broad of medium length, slightly slanting. : Well proportioned in relation to the trunk, of oval to round shape; toes tight and arched, dark nails; the centre pad and the digital pads are sufficiently strong, black or with a dark pigmentation. : Well proportioned, straight seen from behind and in harmony with the other parts of the body. Seen in profile, the angulations are sufficiently closed. : Coxal-femoral angle sufficiently closed; thighs long, wide, well muscled and well filled. : Femoral-tibial angle slightly open; knee strongly built, solid knee cap. : Moderately long, inclined, robust. : Solid and moderately open. : Robust, short and straight; dewclaws, if present, must be removed. : Harmonious, elastic, well coordinated movements; preferred gait and the most elegant is the trot; the gallop with long strides is less elegant. : Thick, compact, elastic, close-fitting, without wrinkles; dark pigmentation; lips edges and eye rims black pigmented. : Well furnished, long, flat, with abundant undercoat. The head the front edges of the ears and the front part of the legs covered with short hair. The back edge of the ears has longer and more supple hair. In its upper region, the neck has long hair, stiff and very bushy forming a mane; in its lower part, the hair is longer and more supple forming a ruff which is wider at the set of the neck. The trunk and belly have long hair which becomes less hard on the belly. The tail regularly bushy, does not form a plume. On the back side of the forequarters, the long hair is very supple forming fringes. On the back side of the hindquarters, the hair is even longer and bushy forming culottes. The length of the top coat is at least 10 cm. : Iron grey; especially on the back, a dark shade is preferred; towards the belly and the limbs, the colour turns without visible transition to a light grey or sandy colour, with a dark streak on the front parts of the limbs. The dark mask on the muzzle spreads on to the skull. On the back part of the head it is bordered with grey or sandy or pale fawn hair overlaid with black.